GEB apart from being an acronym of this department, to the ancient Egyptians Geb was the Grandson of Atum-Ra and very appropriately was the god of the Earth, fitting this geodesy of geodesic studies in geographical cartography. This department is set to develop the revolutionary grid analysis and mathematics of Ananda's new coherent geometrically recursive cartographical system, that utilised the icosahedron and dodecahedron, in recursive Golden Section cascades into the microcosm and macrocosm (see paper The Grid Triad). This is called Unified Field Cartography and is to be developed into Unified Field Universal Navigation. This department is responsible for the computer software development of these cartographical systems. Which eliminates error, and will always work at coherent resonance harmonic pathways of the Earth' geomagnetic field and gravitational field. Enabling both navigation at any scale on the Earth, by precise geometrically linked longitudes and latitudes, with an embedded mathematical sequence that cascades to smaller and larger recursive scales, as well as Stellar navigation systems. 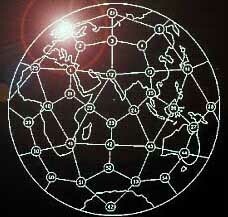 Whereby the same geometrical grid mathematics, are utilised for star navigation, in any geographic locality. And furthermore, by extension can be developed into a time navigator, since the rotation of Earth and her precessional tilt, also marks the same geometrical dodecahedral icosahedral flow in time, over ages. This unification of diverse navigation system protocols, to include the microcosmic and microscopic domains of biology, in the same geometrical coherent mapping system, is set to be the future paradigm for multiple use and multiple purpose navigation, with zero error amplitude. Furthermore, it is a universal navigator, that can be utilised in space flight and space navigation, since all coherent light and magnetic fields follows the same recursive grid coherent geometrics. The long term developments of these mathematical navigational protocols, hence, are set to revolutionise the efficiency of universal navigation, on any scale of creation, a from of Unified Field Navigation system, which yields simplicity in the apparent diversity of complexity, at a very practical level. Useful in a diversity of essential domains, from air flight navigation, cartography, navel and space navigation, time navigation, astrophysical navigation, and microscopical navigation. It will also enable the holographic science studies to be developed that will investigate the holographic relationship of each geometrical scale in influence upon the other. I.e. the stellar, or geomagnetic field, upon the microscopic magnetic coherent grid of say calcium ions within an organism. This, as one can get an inkling of, is an overwhelming significant discovery in its implications, and should receive high level attention. It will also enable electromagnetic grid disturbances to be Bio-assayed (or massaged) into a coherent field nest once more, preventing Earthquakes in geomagnetically unbraided fields detected at Earthquake risk zones, and to stabilise the declining magnetic b-field, to increase environmental health of forests, farm and agriculture domains, and natural reserves, as well as overall human health, and atmospheric quality. The implications in applying this into Geomantic Restorative Technology for the environment are also staggering. Since the coherent fields will yield result in oxygen, ozone, and other protective sheaths of the Earth atmosphere and eventually ionosphere (this is a large domain sector in its horizon, which will begin with making the initial mathematical grids available and accessible to the public, with a user friendly interface that can establish an easily integrated logical understanding of this Unified Field Navigation Cartography. Computer software writers, web researchers for cartographical interphase with CIA's online global cartography, and other related public domain navigation systems (A GOOD DEAL OF THIS WORK IS NOW DONE IN THE PHI GRID. A GPS detecting team. This team work will require going with a Global Positioning System (GPS) detector, of the local area, and larger regions, to pin-point the accurate lat and long data to cartographical maps. Local Bagn and Valdres Commune, will have local scale areas in cartographical software with a zero error factor in navigation. Water dowsers, for potential springs, wells, and water lines. For harmonic arrangement of housing, crop, animal, and human health.